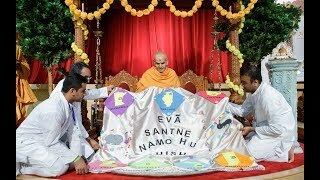 On July 7, 2017, His Holiness Mahant Swami Maharaj was welcomed to the BAPS Shri Swaminarayan Mandir in Chicago, IL with great pomp and enthusiasm by thousands of devotees and well-wishers. 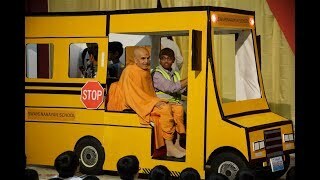 Swamishri’s arrival marked the beginning of a 13-day celebration, between July 7 - July 19, that commemorated Swamishri’s first visit to Chicago after becoming the guru of BAPS. Swamishri’s vicharan was highlighted by grand celebrations held on consecutive weekends during his stay. 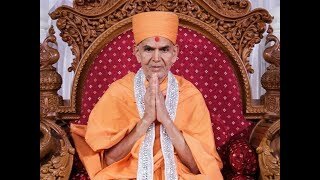 July 9th marked the first Guru Purnima celebrations since Param Pujya Mahant Swami Maharaj became the guru of devotees of BAPS. Throughout the day, devotees offered their heartfelt prayers and devotion to Swamishri. The following weekend, on July 16th, devotees gathered to celebrate Pramukh Swami Maharaj Din. 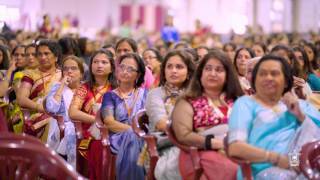 Various programs throughout the day highlighted the life, work, and lasting legacy of His Holiness Pramukh Swami Maharaj. It was an opportunity for all to reflect on the indelible impact that Pramukh Swami Maharaj has left on the hearts and minds of so many. Various other events throughout Swamishri’s visit included special programs for children and youth (Shishu Din, Bal-Balika Din, Kishore-Kishori Din, and Yuvak-Yuvati Din), a women’s cultural program (Mahila Din), and a 2-day family shibir focusing on strengthening family unity.